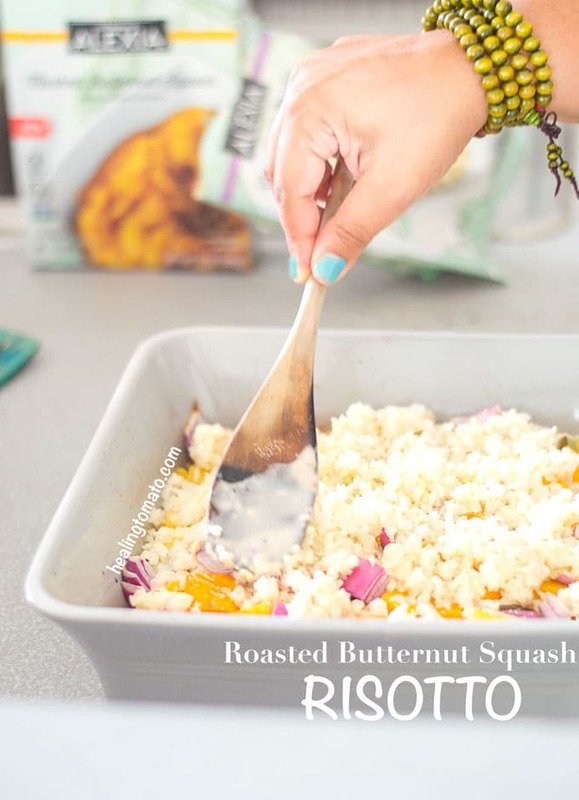 Roasted Butternut Squash Risotto Casserole is a perfect vegetarian Thanksgiving side dish. It takes only 40 minutes to make and you only need a few ingredients. This post is sponsored by BabbleBoxx on behalf of Alexia! If you are a vegetarian, you will always have a hard time finding things to eat at your family or friend’s Thanksgiving table. Most of the time, I end up munching on the dinner rolls or roasted asparagus. 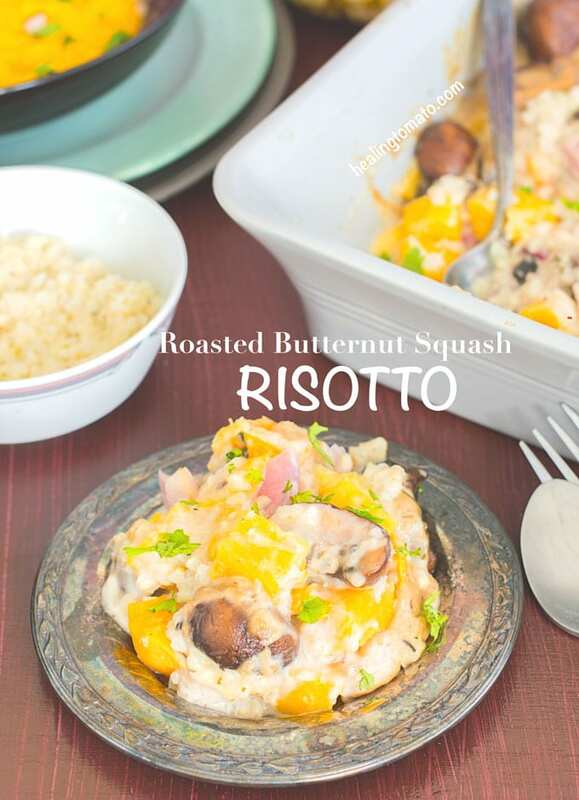 Now, I get to take this delicious roasted butternut squash risotto as a side dish. The risotto is actually cauliflower crumbles instead of actual rice. I discovered Alexia’s Cauliflower Rice Risotto with Parmesan cheese and had to try it in a casserole recipe. The risotto is part of their All Natural Side Dishes! I also tried their mashed butternut squash which was delightful. 1) They are delicious – You know how weary I am about eating frozen foods, right. However, I was pleasantly surprised by the risotto and the butternut squash mash. The butternut squash was especially delicious because it was so smooth and mushy. The risotto completely blew me away. It was well cooked and the Parmesan cheese didn’t over the whole dish. 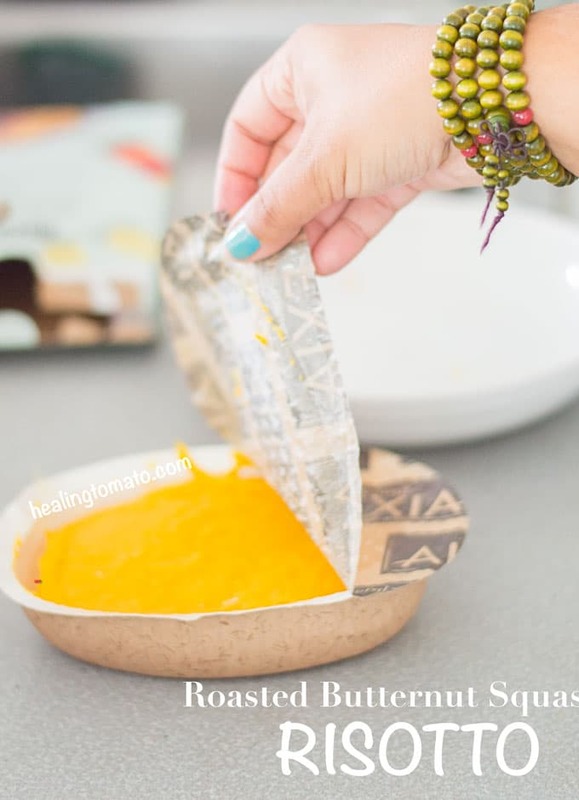 2) They are so easy to make – Just remove and heat. The side is ready in 2 minutes flat! That’s my kind of easy! The cauliflower risotto is even perfect for a light lunch recipe. On days that I am too busy, I can have it as my healthy lunch option. 3) They use dairy from cows that are not treated with rBST. You can find more info about that on their website. 4) They are low in calories! 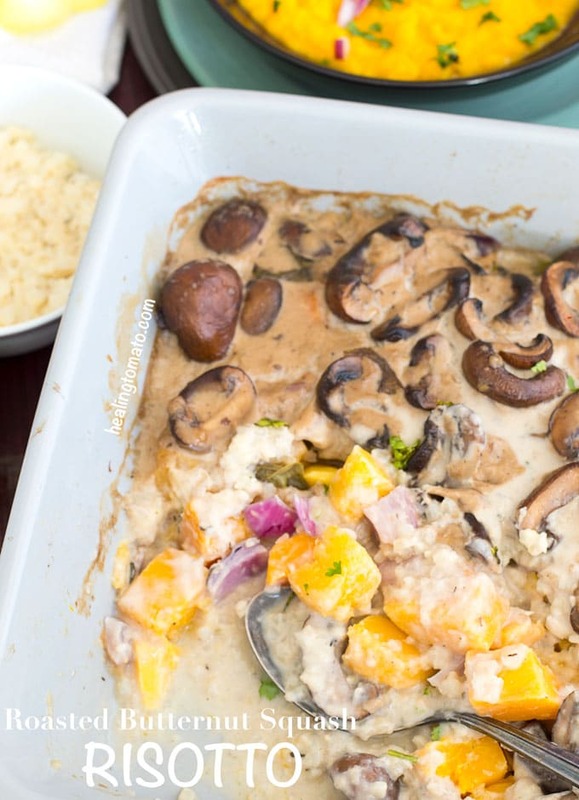 – Both the risotto and the mash sides have 80 calories per serving. For this recipe, I roasted butternut squash first to get that delicious smokey flavor in the recipe. 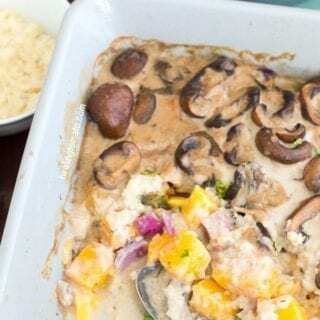 Then, I layered it with the cauliflower risotto and topped it with a creamy mushroom sauce. For a crunch, I added some red onion cubes and it was so good! The mushrooms in this roasted butternut squash risotto are cut into half instead of thinly slicing them. I liked how the big cuts of mushroom textured the casserole. You can slice them thinly, if you prefer. 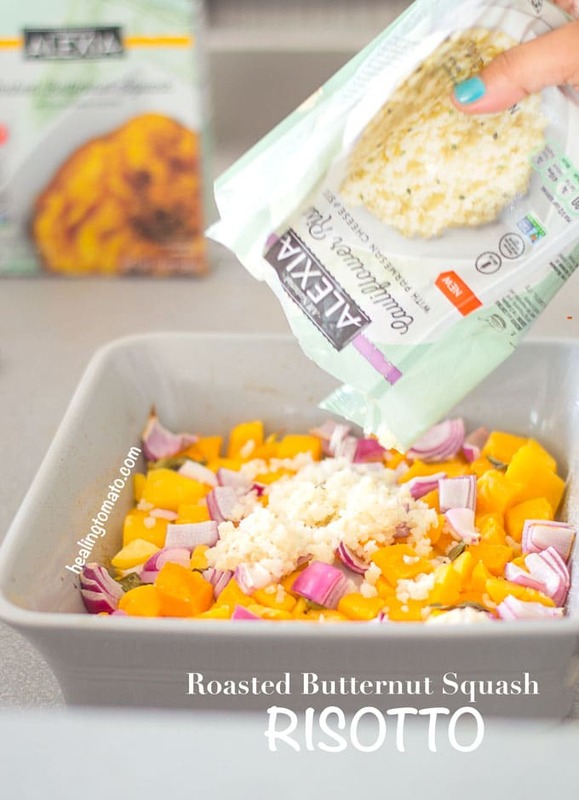 The butternut squash mash taste great by themselves, so, no need to add anything else to it. If you like texture, I recommend adding tiny pieces of red onions because they add a nice spice to the butternut squash. But, it tastes better just by itself. I just love it when companies make my life easier! 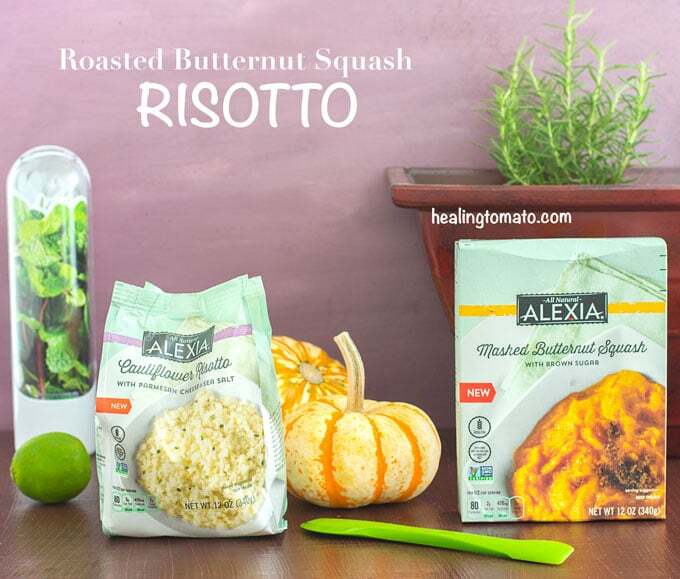 Alexia is one of those companies that are good because they made it very easy to heat up the butternut squash. All I had to do was remove the cover from the container and microwave it. I like to hallow out butternut squash and use them as bowls. I think a hallowed out squash would make a perfect bowl for this recipe. What do you think? 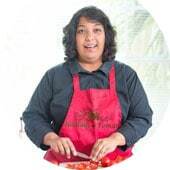 Now its your turn to tell me about your holiday menu plans. What family members are you inviting to your dinner table? What friends are lucky to be sitting at your Thanksgiving table? What recipes are you making? Which recipes will always be on your holiday table? Sound off in the comments section at the bottom. When they have shrunk to half their size (about 5-7minutes), add the mint, spices and salt. We have vegan friends coming for Thanksgiving so I know I will be scouring your site for some yummy ideas. I love this one! My goodness that looks scrumptious! Mouthwatering and a comforting dish, perfect for family dinner night and easy to enjoy in front of the TV. I’ll be on the lookout to purchase the cauliflower risotto, what a meal!